In the latest issue of Counterpunch, JoAnn Wypijewski tells the story of Keith Jennings, a resident of Stony Ridge, Ohio. Mr Jennings couldn’t keep up with his house payments, so the bank owns it now. He has responded to this by enlisting a group of local youths to seal the house off, covering it in tar and cement. Ms Wypijewski is at pains to portray Mr Jennings and his cohorts as a thoroughly unheroic bunch. Their lack of heroism is precisely what makes their odd little story seem urgent to her. They stand for all the forgotten eccentrics who have, over the centuries, done odd, apparently pointless things that have made life a little bit more complicated for people in power, and have thereby helped to prepare the way for the great figures whose names we do remember. Harry Browne asks “How Toxic is the Fog of Benevolence in Foundation Journalism”? Mr Browne points out that, while many people express concerns about possible conflicts of interest when journalistic enterprises are parts of big businesses, very few express such concerns about journalism that is funded by philanthropic institutions. Considering that philanthropic institutions are usually endowed and overseen by the very people who have the greatest influence over big businesses, this certainly is a strange state of affairs. It is all the stranger in view of the fact that for-profit journalism must appeal to a broad public, while charity projects need only satisfy their funders. I began to notice that when children “spoke in tongues,” it sounded remarkably similar to the way their parents sounded when they spoke in tongues. I noticed that everyone simultaneously knew when to bow their heads, when to stand, when to sit, when to clap, when to say Amen! It was in that moment that I knew to the very core of my being that I had been, and all of them were, brainwashed. My reaction to this was a bit complicated. Mrs Acilius and I pay regular visits to a couple of nearby Anglican and Lutheran churches. There, everyone simultaneously knows when to bow their heads, when to stand, when to sit, when to kneel, when to say amen. If that’s the result of brainwashing, it’s the least subtle brainwashing imaginable. They give you a paper when you go in the door on which a full set of instructions are printed. It isn’t subliminal recruiting, but superliminal recruiting. So the picture Ms Ortiz painted did not immediately strike me as sinister. On the other hand, most Sundays we can be found in a Quaker meetinghouse. Mrs Acilius is a member of the meeting, and I am also active in it. In traditional Quaker meetings, shared silence is communion and an explicit agenda is a sign of the secular. The one we attend isn’t like that. They have a bulletin with a list of Sunday morning Protestant stuff, including hymns, a sermon from the pastor, etc etc etc. There are some moments which are not stuffed full of planned events, what Quakers call “Open Worship.” In these moments we usually sit silently together, but occasionally someone feels compelled to speak. These moments are usually too brief to be a meditative experience that quiets the mind. Frankly, that’s part of the reason why we keep going back to the neighboring liturgical churches; a well-executed service there is a single experience, and has a clarifying effect similar to that which an hour of meditation in communal silence can provide. By contrast, the brief interludes of silence in our very churchy Quaker meeting often represent interruptions in a little series of tasks that all concerned are busily keeping up with. Even so, the meeting fits into what is often called the “Free Church” tradition of Protestantism, in which congregations value spontaneity and individualism. Because of these values, Mrs Acilius’ fellow members grow uneasy when we remark on the amount of busy-ness that is packed into that hour. Thinking of their reactions when we talk about how little spontaneity there is in the meeting, it is easy to understand how a Free Church Protestant could be shocked to see a group of worshipers behaving in the highly coordinated manner Ms Ortiz describes. From the late 1970s through the mid-1980s, I watched Star Trek about 4 times a week. I’ve had occasion to watch it since, and it holds up. It’s a good show, and an interesting specimen of 1960s liberalism. Of course, when I see it now I also feel strong nostalgia for that period 30 years ago when I watched it regularly. 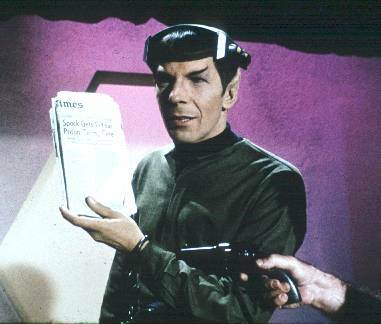 Leonard Nimoy, made up as Mr Spock, holding a newspaper announcing that Dr Benjamin Spock had been sentenced to prison for antiwar activities. Mr Nimoy and William Shatner, in character as Mr Spock and Captain Kirk, reading Mad magazine. A large furry fellow from the planet Taurus II, who looks remarkably like a guy I went to high school with. A mesa under a brilliantly starry sky. A version of the transporter effect. Chart of a solar system. Lieutenant Uhura holding Marlena Moreau at phaserpoint. An article about brain parasites that breed in cats and spread to creatures, possibly including humans, that then become unreasonably attracted to cats appeared in the March 2012 issue of The Atlantic. The article triggered vast amounts of comment around the web; I’ll just mention that it appeared at about the same time Gregory Cochran argued on his “West Hunter” blog that the likeliest biological basis for homosexuality is a brain parasite. If this strikes you as an obnoxious point to make, you are well on your way to grasping the nature of Dr Cochran’s mission. The same column in which Hitchens tried to salvage his theory that 9/11 was a reprisal for Hilaire Belloc’s prose style includes a quote from G. K. Chesterton. Chesterton and Belloc were so closely associated that in their day they were often referred to as “Chesterbelloc.” This issue of The Atlantic includes an essay by Hitchens about Chesterton, who was apparently one of his favorite authors. I didn’t think of it in 2001, but it explains a great deal about Hitchens to think of him as a follower of Chesterton and Belloc. Like those men, he was a prolific writer who prided himself on a fluent style, showed significant erudition in a wide range of fields, and did not particularly trouble himself about questions of fact. Also like Chesterton and Belloc, he was an insistent and grossly unfair apologist for his religious ideas. Chesterton and Belloc defended the Roman Catholic church by presenting every other faith tradition in an absurdly negative light; Hitchens simply added one item to their catalogue of strawmen when he set up shop as a professional atheist. The essay in this issue raises the possibility that Hitchens imitated at least some aspects of Chesterton and Belloc’s work deliberately, as well as exhibiting an influence that stemmed from his early and long exposure to them. Sandra Tsing Loh describes the difficulties she faces adjusting to the idea that her father, Eugene Loh, is in a long, terminal decline, and that she is his caregiver. The article’s hook is “Why caring for my aging father has me wishing he would die.” I shouldn’t think that would require much explanation. It is difficult to watch a loved one suffer irretrievable losses, stressful to take care of another person, and natural to resent unfamiliar responsibilities. I suspect that everyone who has ever occupied Ms Tsing Loh’s current position has at least momentarily wondered how much nicer things would be if the other person would just hurry up and die already. If Ms Tsing Loh had written a short story about a fictional character in her position who couldn’t shake that thought, she would have explored a facet of the human experience* that needs acknowledgement. By choosing to forgo the distancing mechanism of fiction and write a first person account, complete with photographs of Mr Loh, she is performing an entirely different sort of speech act. She is not only confessing to this wholly predictable, probably well-nigh universal human response; she is also confronting her father and everyone else who loves him with a demand that they discard pretenses that have become conventional because they often make life more comfortable for people in their situation. That demand, if met, would create a new kind of social situation, one which would be “honest” in the sense that it leaves raw emotions unconcealed. However, that very honesty is another form of role playing, in which the members of the group play roles that might be appropriate in a therapeutic setting, though not necessarily so in the setting of a family group that is supposed to survive for many generations. To keep people together for that long under all the stresses that come with family life, it’s necessary to develop a shared understanding of boundaries and to define ways to renegotiate boundaries. Without those understandings, it’s impossible to predict each others behavior, which means that it is impossible to communicate without leaving the impression that one is saying more than one intends. If Mr Loh were to recover the ability to read, I can hardly that he would not flinch when he realized that he was the theme of sentences like “if, while howling like a banshee, I tore my 91 year old father limb from limb with my own hands in the town square, I believe no jury of my peers would convict me. Indeed, if they knew all the facts, I believe any group of sane, sensible individuals would actually roll up their shirtsleeves and pitch in.” He might laugh, but I’m sure he would flinch. *I’m familiar with the arguments against the phrase “the human experience”, and I still like to use it. If you rehearse those arguments in the comments, be prepared to read long discussions of the thought of Irving Babbitt in response. 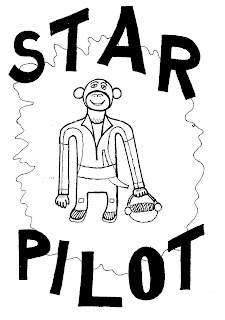 I’m glad to say that I’ve received an advance copy of Star Pilot #7, the latest installment of our favorite photocopied comic book. In this one, Jules Jupiter, super-intelligent simian who sometimes flies among the stars and sometimes acts as a roving sleuth here on earth, travels to a fictional country where a dictator has spent 30 years or more trying to erase all awareness of history from the minds of his compatriots. Jules meets an old man who tells him of a legendary pop star from the 1970s whose music might restore freedom. In an apparent nod to Star Wars, the old man reveals himself to be this pop star. As in that venerable film Old Ben Kenobi resumed the name Obi Wan and took up the light sabre again after he revealed his true identity to R2D2 and company, so Julio Clemente resumes the name JuCle and takes up his electric guitar again after he has told Jules Jupiter his story. The story reimagines this pop culture classic in a nonviolent form. There are no explosions, no shootings, no sword fights,only music and the prospect of a negotiated settlement. That fits with the peace-minded ethos of the previous issues, but is still a surprise in the ultra-violent world of comics. Check Jules Jupiter’s online store to see when it will be available for purchase. Issues 1-6 are there now, at the amazingly low price of $1 apiece.